If you are thinking of having cavity wall insulation installed then always remember to check all your wall ties out first. Believe it or not before 1981 metal wall ties were generally manufactured with too little protective coating. Once the protective layer breaks down wall tie corrosion can become a problem. The remedy for cavity tie corrosion is typically twofold; installation of a replacement wall tie system and, where the property was built with vertical twist ties, the removal or isolation of the rusting tie. There is a school of thought that cavity insulation can exacerbate the tie corrosion process if it becomes damp or wet. The insulation may become wet through rainwater ingress at vulnerable openings or by driving rain being absorbed through the wall itself. Indeed for this reason, building control does not recommend retrofit cavity insulation where a wall is exposed to driving rain and the cavity is less than 75mm wide. Why checking wall ties is so important! Wall ties are generally made from mild steel. Unprotected steel rusts in the presence of oxygen and moisture. Rust, or iron oxide, occupies greater volume the base metal from which it is formed and therefore corroding ties increase in dimensions during the rusting process. The build-up of iron oxide layers creates irresistible expansion forces that have the potential to literally lift the wall. This lifting often exhibits itself in the form of a series of horizontal cracks. These cracks split the wall at regular intervals weakening the structure and allowing dampness into the cavity. In traditional masonry buildings wall tie spacing is at 900mm x 450mm centres, equating to 2.5 ties per m2, with additional ties adjacent to open reveals. It is important to ensure that sufficient ties are in place to resist the expansion of foam injected cavity fill. Replacing corroded wall ties becomes much more difficult after cavity wall insulation has been installed. 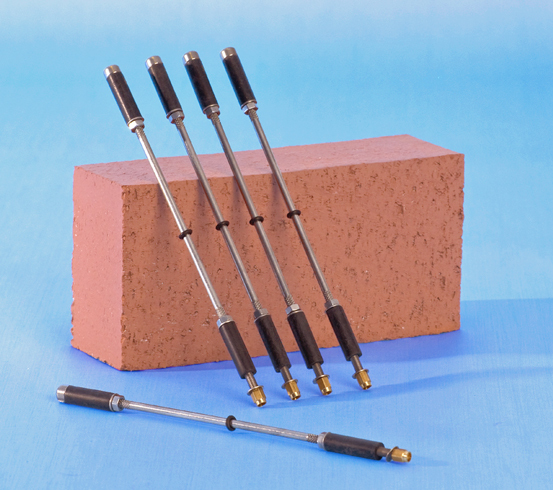 Remedial wall ties are typically installed via a hole drilled into the masonry. In an insulated wall this drilling process not only deposits a large amount of detritus into the cavity insulation, but also leaves a hole or a potential reservoir in the insulation. A recipe for disaster! These holes provide potential for water to track across the cavity and cause penetrating damp spots on the inner wall..
Where the rusting ties are of the vertical twist type, or have a similar mass, they need to be removed or isolated to protect the wall from splitting damage caused by the corrosive tie expansion. Before a cavity wall is insulated, a perfectly safe and economical method of treating corroding ties is to chisel away the mortar surrounding the tie and isolate it from the masonry with a rust-inhibiting tie sleeve or with foam that is able to absorb the expansion. However once the cavity has been insulated the debris from the chiselling tends to be forced into the insulation, creating serious potential for damp. BRE Digest 329 states that such isolation methods should not be used where it is impossible to remove the debris from insulated walls..
Where walls are insulated and corroding ties require treatment one needs therefore to use the more expensive option of removing the ties entirely from the wall. To remove the ties one will need to take out and replace individual bricks at wall tie locations. The debris dropping into the insulation will need to be removed and the disturbed insulation will need local replacement before the bricks are reinstated. The practical and cost advantage of checking for wall tie corrosion before having the cavity insulated makes good sense, as this is the time when cavity tie replacement can be carried out most easily and at low cost. BRE Digest 401 contains a table to visually grade the condition of the ties and to assess their service life. Once walls are insulated cost effective options become limited and the potential for remedial work to contribute to penetrating dampness escalates. A remedial wall tie for rapid cavity wall tie replacement. The 9mm Stainless Steel helical tie is a self-tapping replacement wall tie which screws into brick, masonry and concrete when hammered into a 6mm pilot hole using the impact action of a hammer drill (use a 7mm bit for engineering brick). For the fixing of these ties you will need a drill bit of appropriate length and a wall tie fixing tool. Available in packs of 50 and as a 60m2 Remedial wall tie kit this tie is suitable for all types of masonry (BRE digests 329 Decision Tree). A mechanical wall tie for cavity wall tie replacement. The tie has an expanding brass shell mechanism at each end of an Austenitic Stainless Steel Bar. The expanded wall tie features a part threaded nut which when turned rotates the bar forcing open the shell up conical ramps to grip the remote masonry leaf. At a factory set torque level the bar taps a thread in the remainder of the nut to force it down the bar, expanding the near leaf to grip the wall. Available in boxes of 150 ties and comes with a free setting tool. You will also need a 10mm drill bit of appropriate length and a torque controlled screwdriver to fit these ties. A quick fix mechanical tie that has durable neoprene expansion sleeves at each end of an austenitic Stainless Steel Bar. The quick fix replacement tie features a threaded tall nut which when turned rotates the bar forcing open the neoprene sleeve to grip the masonry leaf. At a factory set torque the bar taps a thread in the top of the tall nut to force it down the bar expanding the near leaf to grip the wall. These ties are suitable for all applications except for use in perforated bricks are where a fire resistance of greater than half hour is required. (BRE Digest 329). The Ties are available in boxes of 150.You will also need a Quick fix mechanical wall tie setting tool attached to a torque controlled screwdriver and a 11mm drill bit of Appropriate length. Resin grouted stainless steel replacement wall ties are a slim 5mm tie which permits maximum flexibility whilst the deep helix offers superb keying with resins or grout for wall tie replacement in brick. Resin grouted ties are suitable for use in all normal domestic installations except where a fire resistance of half hour is needed (Bre Digest 329). The ties are available in packs of 250 and for fixing you will also need a 10mm drill bit, blow pump, polyester or epoxy resin and an applicator gun. A flexible timber frame tie for fixing timber frame structures to a masonry facade on new build or for retro fit where insufficient ties have been installed. The self-tapping tie is hammered into a timber stud at one end and the other is built into the mortar bed. For retro fit the outer leaf is rosined into the brickwork; the ties are installed at 4.4 ties per m2 and for fixing these ties you will also need an SDS tie driving tool. For Retro-fit applications you will need a 6mm drill bit of appropriate length and some injection resin to make the connection into the masonry. Twistfix replacement wall ties are available in various lengths to suit set cavity widths. For more information about cavity tie replacement and wall insulation phone 0845 123 6007 or email info@twistfix.co.uk.